Official city promotion. City promotion by citizens. Still from the promotion video "Hamburg, a perfect day" at the official website hamburg.de. Click here to see this video. School class 10b, Klosterschule Hamburg. They have created an alternative pr-video about Hamburg. officially to promote Hamburg for tourists. Click here to see their video: You arrive at artgendaTV streamarchive - find City promotion by citizens further down. Rainer Scheppelmann was a Senate speaker when he ordered the film Hamburg a perfect day. 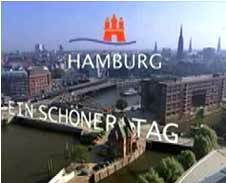 Ilona Huss Walin, has invited a Hamburg school class to create their own promotion video about Hamburg. The official and the alternative video was shown together out in the city room. Class 10b meets Hamburg.de during a TV-show. produced by North East European cities. This year Hamburg is the hosting city.